The practice of forced labor in the cotton sector began in the Soviet period and has continued without interruption to this day. It is used on a massive scale, despite the fact that cotton is no longer the chief export commodity for Turkmenistan. 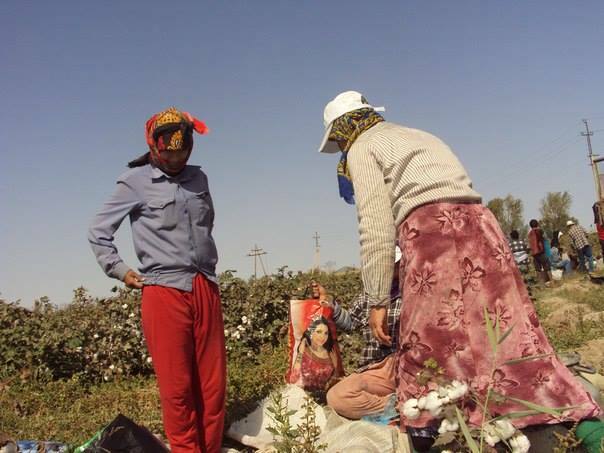 Every season, tens of thousands of Turkmens from cities and the countryside are forced to work in the cotton fields. Mandatory standards are set for the amount of cotton harvested, and those who refuse to go to the fields or are unable to meet the quota are either fired from work or are punished in other ways. 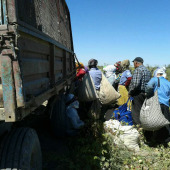 By forcing citizens to harvest cotton, Turkmenistan is violating the ILO Convention №105 on the abolition of forced labor and the Convention №29 on forced and compulsory labor. Furthermore, the government of Turkmenistan is violating its own Labor code, section 8 of which defines forced labor as «any labor one is forced to do against his will under the threat of some form of punishment, to which one did not agree to voluntarily». 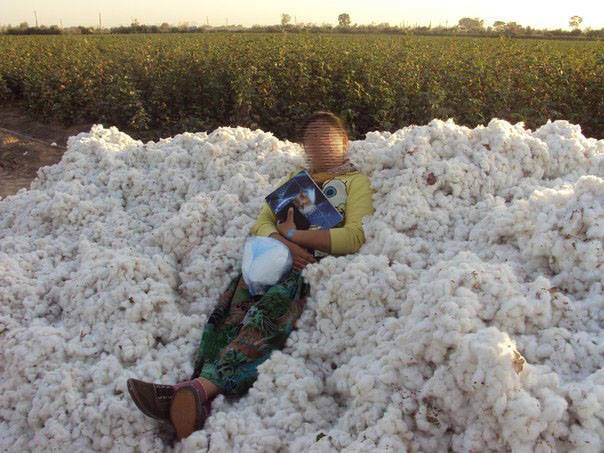 The cotton season is ending in Turkmenistan. Despite the fact that almost all areas of the country have met their expected quotas, in some areas people are still forced to go to the fields. By the end of October, the weather in some regions, such as Dashoguz and Lebap, has changed drastically and heavy rains began. The fields are wet and dirty and, hence, some people refuse to leave the buses when they arrive to the fields. Precisely this scenario unfolded in the Sayat village of Lebap region. A member of the local government found a solution to the problem and sent the bus to a nearby field, at the other end of the village where, apparently, it was not raining. The lessee of the land, however, refused to allow city dwellers to pick cotton on his field, and even threatened to release his dogs. He added that only his family harvests cotton on this land. According to him, those who are forced to pick cotton do not do the job well, and only choose to pick cotton off the bushes with a lot of cotton, avoiding those with less. There are many examples of instances when those, who were forced to harvest cotton are chased off the fields and there are several reasons for that: the lessees of the land want cotton to be harvested well, conscientiously, since they have to pay the city harvesters a daily fee and feed the workers once per day if they stay overnight. Another difficulty the lessees face is behavioral problems and fighting that often starts when those staying overnight for long periods of time start to drink alcohol. In the Sayat region one such drunk worker demanded the land lessee cut his sheep for dinner and when the man refused, the worker went for the paddock intending to cut the animal himself. He was stopped by two sons of the lessee, beaten severely and sent home on foot. In the Garlyk village a manager and an employee of a «Lebapteplo» factory beat one of the laborers to death. All of them drank alcohol before the incident, this happened on October 8. The perpetrators have been detained and currently the witnesses are being questioned. We know of many similar stories and often they end tragically. In the Lebap region, on the day mentioned above, people finally began picking cotton only at 2 pm, when a suitable field was finally found. People were puzzled and wondered if the bits of cotton they were able to pick during the remainder of the day were worth skipping a day of work at the hospital or school. The cotton was wet, so the gloves of the workers quickly got wet and their feet were wet up to their knees as well. By the end of the evening, many began to feel ill, but they had to return to the field the very next morning. On October 26 there was hail and wet snow, but despite these weather conditions people were still sent to harvest cotton. Arguments erupted often for various reasons, especially during the process of weighing the cotton picked. Sometimes, the land lessees subtract 10 kilograms from the total amount of cotton picked by each worker because the cotton is wet from the rain. This, of course, means that the workers receive less money for the work done. Disappointed workers, who see this practice as unfair, respond by refusing to continue working and spend the rest of the day waiting for the bus to go home. In our previous reports we mentioned that if a person decides to hire a worker to replace him in the fields, he is still required to report to his regular workplace and work a full day. The teachers of Dashoguz region found a way to not go to the field and not go to work. In the morning the teachers get on the bus and make sure their presence is noted on paper. At the next street corner they get off the bus and hired workers enter the bus as replacement; these workers are paid by the teachers to pick pro forma 10-15 kg of cotton per day. The teachers then take a taxi to return back to the city and the hired workers continue on the bus to the fields. The Lebap region has not yet met the quota assigned to it for the season. Of the 300,000 tons assigned, Lebap has harvested 93% and of those, we hear, 25% were bought by the governor from the neighboring region — Mary. The governor of Lebap was responsible for meeting the quota by November 10. Because of this shortage, regional and city heads hold daily meetings that last past midnight where they scold the directors of companies for the small amounts of cotton their employees have picked and for the shortage of workers out on the fields. In some companies, for instance, in the regional multidisciplinary hospital, the workers have stopped going to the fields, because, as they say, they are «sick of it». The heads of the state healthcare ministry demand explanations, but the employees reply that the country, as a whole, has already met the yearly quota for cotton harvested, hence there is no sense in going to harvest more. Currently, the only people who remain out in the fields are those who stay overnight or those hired as replacement by workers who instead stay at home. The teachers continue to be sent to the fields and despite the fact that the cotton season is ending, they are nevertheless sent to work 2-3 per week. Local leaders are convinced that the region will not be able to meet the planned quota because barely any cotton remains in the fields. Even according to the official records, the daily increase in cotton harvested is about 0.3%, which is very little. In the previous years, when similar situations arose, governors of some regions took unprecedented steps in order to try to meet the quota. They closed the local markets and stopped all local transport in order to employ all of the local merchants, entrepreneurs and even market shoppers. Such measures were once undertaken by the governor of Dashoguz, Habibulla Durdyev, who ordered to close the central market of Dashoguz and to station police officers on every road in order to block traffic. Last year the local market was also closed by the governor of Farab region, in the North of Turkmenistan. Both cases ended with protests and with the victory of these protesters; in Dashoguz, local merchants marched along the central city street all the way to the regional administration building, where they broke all of the windows and in Farab they broke the lock which was used to close the marketplace and resumed their work. This season we received no indication from the Dashoguz or Lebap region that such measures were undertaken. In the previous report, however, we did mention that the owners of the outlets at the market were forced to either send workers to the fields or to pay for hiring replacement workers. The entrepreneurs themselves did not pick cotton, but they regularly bought special certificates that attested to the fact that they supposedly did harvest cotton and handed the certificates to the Tax Services. All of the actions undertaken by the governors are dictated primarily by their fear of the president. According to a practice that has developed in Turkmenistan in the recent years, the governors lose their positions more often because of the amount of cotton harvested than because of their offenses or misuse of power. During the rule of president Niyazov, there were instances when governors were dismissed from position after having been in office for barely 6 months because their region did not meet the planned cotton and wheat quotas for the year. This was so despite the fact that the governor came to office in the fall, while the wheat season referred to was in the spring, before the new governor had taken the position. During Berdymuhamedov‘s rule, such instances became less and less frequent primarily because the planned quotas were lowered to a level more consistent with the reality on the ground. And yet, in the Lebap region, there already is talk about governor M. Dzhoraev possibly losing his post precisely because his region is not able to meet the cotton quota for the season. The governor has been in office since April 12, 2013 and the cotton sowing season officially started on March 24. Most people who are sent to the cotton fields every year understand the viciousness of the practice; however they are unable to speak their mind for fear of losing their jobs. They also dislike the fact that state employees based in Ashgabat and, more generally, in the Ahal region, are excused from having to harvest cotton. In fact, the residents of the region are surprised when they learn that the life in the rest of the country practically freezes for the period of the cotton harvest and those working in the social sector are absent from their work places for 3 months straight. Most people believe that at least those, who work in hospitals, clinics, schools and kindergartens should remain at their workplaces where they do a lot of good for the people rather than be mobilized for the cotton harvest. Truth be told, all o the employees of the social sector should be excused from working in the fields especially since the farmers themselves are against their help (we will talk of the land lessees further). Despite the fact that school students are no longer required to harvest cotton, forced labor is still widely practiced throughout the country and we see no change in this respect. We do not have any indication that this will change for the better. We do not, however, consider the situation to be hopeless. The cotton campaign would not be such an arduous task for thousands of employees of the social sector, if the government would reform the system of organization of labor in the agricultural sector as a whole, and, more specifically, in the cotton sector. Firstly, it is important to know who is the lessee of the land that is being harvested. We have information that shows that in the majority of cases, when the regional employees of the social sector are used as cheap laborers, the land is owned not by local farmers, but by high-ranking state or regional officials. These officials rent out land under the names of their wives, children, other family members, etc., however they do absolutely nothing by way of harvesting cotton on their land; many of these officials do not even live on this land or even in the region where the land is leased. Real farmers, who live on their land, refuse to allow city workers to pick cotton on their soil. It is much more profitable for them to harvest cotton on their own, particularly since the strips of land they own are not large, not more than 3 hectares. The officials, who rent land, however, would never be seen harvesting cotton on their land. Given the situation, the government should review all the land leases and ownership papers for large strips of land and take land away from those officials, who have leased it out under the names of their relatives in the hope that one day they would come to own the land. Secondly, there would be no need to force employees of the social sector to pick cotton if the government would review and increase procurement prices of cotton and payments per kilogram of cotton picked. Currently, the government pays the land lessees 1,040 manats ($365) for one ton of cotton harvested (the price takes into account discounts for humidity and waste). Although this amount has risen more than 5 times since 2007, it is still lower than it should be, considering the fact the land lessee will only receive 2/3 of the amount at best or even 1/2, because he has to pay for seeds, fertilizers, tractors, etc. A land lessee in Dashoguz, who has 2 hectares of land, has to sell the government 800 kilograms of cotton to make sure he at least covers all the costs. This year he harvested 2.5 tons of cotton — not a bad result, considering the fact that there was not much water available this year. This means that the government will pay him 2,600 manats ($912), of which he will pay 830 manats ($292) for services and fertilizers. In the end, he will be left with 1,768 manats ($620) and that is all the money he will have for the year for himself and his family. Many land lessees try to harvest cotton on their own, together with their families, in order to make the maximize profits. Officials who lease land, however, have land strips much larger than they could work themselves and so need the help of cheap laborers. The system for mobilization of workers can be described this way: the president demands a lot of cotton from the governors; the governor, assisted by those who are in the know, identifies the fields where there is the most cotton and then gathers local heads directing them to send people to those identified fields. The land lessee pays each hired worker only 20 manats and even this small amount comes from the government. Thirdly, several years ago, in order to motivate land lessees to increase the amount of cotton harvested, the government offered them cottonseeds and all of the products obtained during processing — cottonseed oil, cottonseed meal and husk, free of charge. This development was met with excitement and increased desire to work, since cottonseed products can be sold and hence bring additional income. Cottonseed meal and husk can be used as animal feed for the cows, allowing some farmers to have a small dairy production right by their homes; the remainder can be sold at the market. Later, however, this relatively good system drowned in bureaucracy and corruption. In the end, the farmers could not get the products in time, in full, unless they separately paid those who provide, deliver and distribute these products. At this moment a stimulus to the farmers still exists, but only on paper. For example, the government allows the land lessees to do what they please with the cotton harvested beyond the planned quota. They are also allowed to sell excess cotton to foreign buyers via State Commodity Exchange (TGSB). However, in 2012 only a handful of people in Dashoguz — a large cotton-harvesting region, used their right to sell the excess cotton abroad. And, even these few turned out to be former or current regional heads, who have large land strips in the Shahsenem zone, Ruhubelent region. Fourthly, an end should be put to the economic illiteracy of the farmers. Special courses should be taught at the farmers unions by economists, agronomists, regional specialists and specialists from «Turkmen Cotton». These specialists would share information on the opportunities and rights of the farmers to free association, describe ways of using these rights, explain how to enter the exchange with cotton products, and describe mechanisms for selling excess cotton. Another reason for the government to conduct the land reform is to finally effectively and productively use the American cotton-harvesting combines. The land reform would take land away from those lessees, who year after year do not meet the planned quota, hence requiring the help of city residents during the harvesting season. Then, having combined these strips of land into large segments it would be possible to use harvesting combines. Turkmenistan currently has nearly 1500 such machines. The land, assigned for mechanized harvesting, could be processed by groups of farmers, united into specialized teams. The farmers would be paid based on the amount of cotton harvested by the end of the year — a common practice in the Soviet period. The cotton harvest campaign 2013 has ended. This year’s campaign has again revealed the very same problems Turkmens have been facing for years. Delays with addressing all of the above-mentioned problems would mean that the picture would remain the same in the coming year.